You’ll Be FALLING For These Fall Squash Recipes!You’ll Be FALLING For These Fall Squash Recipes! You’ll Be FALLING For These Fall Squash Recipes! With these tasty autumn recipes, you will be enjoying fall squash the way it was meant to be enjoyed! With the cooling weather and the changing leaves come some of the most delicious fall dishes! When you buy locally-grown, organic fall squash, your fall meals will taste fresh and comforting every time. With these tasty autumn recipes, you will be enjoying fall squash the way it was meant to be enjoyed! Acorn squash is not only beautiful in shape and color. It is amazingly tasty as well. 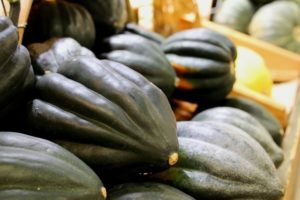 Acorn squash is delicious because it’s a little sweet and a little savory at the same time, making it a fall favorite. The most popular way to serve acorn squash is to roast it. If you like to keep things simple, all you need to do is sprinkle on some salt, pepper, and olive oil and roast in a 400-degree oven for 25 minutes. For those who are willing to try something new, toss your sliced squash in parmesan, melted butter, your favorite herbs, garlic powder, salt, and pepper. Roast in a 400-degree oven for 25 minutes, and serve hot! Butternut squash soup is a classic autumn favorite. It’s the best way to warm up as the weather cools down. When you choose organic butternut squash that has been grown on a local farm, the taste you enjoy will be even better. After combining all of the necessary ingredients in a large soup pot, bring to a boil and cover for 35 minutes. Puree the soup with an emulsion blender then add the heavy cream. Bring to a simmer, and add salt and pepper as you see fit! Spaghetti squash has become a fall entree staple. You can easily add your favorite tomato sauce and parmesan cheese for a quick, low-carb dinner. You can also make a cold weather favorite, stuffed shells, and serve them over spaghetti squash. The perfect way to add a little green into your fall comfort meal! This entry was posted on Friday, September 21st, 2018 at 3:41 pm. Both comments and pings are currently closed.